Should Democrats Be Feeling Good About the 2018 Elections? As is often the case these days, our political attention moves quickly. Days after Donald Trump’s unexpected victory in 2016, discussions had already started around the 2018 mid-term elections in Congress. After getting over the shock, talks of a Democratic wave began in earnest and have been growing since Trump took office. Our question became, is this just wishful thinking for Democratic supporters, or is it based on actual data? The prevailing wisdom, coupled with historical trends, points to the Democrats picking up seats in Congress, but there is a big difference between a handful of seats and Democrats being likely to win back control of the House. Fuel was thrown on the “Democratic wave” fire when the most recent FoxNews poll gave Democrats a 50% to 36% advantage in the generic horse race. But one survey in November of 2017 is not the final word. With this in mind we decided to look past the horserace and get deeper into the motivations Americans have when it comes to the upcoming election. With 12 months until Election Day 2018, Democrats still have a way to go if they want a wave to develop. In our latest national survey, we asked Americans not just which candidate they were likely to support but what their preferred outcome is for the 2018 midterms. Are voters hoping for a Democratic Congress acting as a check to the President’s agenda, or are Americans looking for a continuation of one party control? 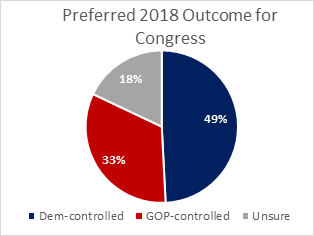 According to our results, nearly half of Americans’ (49%) preferred outcome is a Democratic-controlled Congress. This is a similar result to the generic ballot in the recent FoxNews Poll, which should make Democrats happy, but before anyone starts popping the champagne corks we should look into the numbers a little more. Not surprisingly, Democrats are strongly on board with Democrats controlling Congress. Indeed, 87% support this outcome (5% would prefer Republicans to remain in charge). On the other side of the aisle, 12% of Republicans would like their party to lose control, while 74% would like the GOP to retain it. This is clearly a slight advantage for Democrats, but where they have certainly not sealed the deal is among independents where just a third would prefer a Democratic take over, while 25% would prefer the GOP to maintain control. A plurality, 41%, are unsure of their preferred outcome at this time. Demographic patterns of these two viewpoints also hold expected patterns. Those hoping for a Democratic takeover tend to be more diverse and younger than the voting electorate as a whole. Almost half (48%) are people of color and 48% are younger than 45. 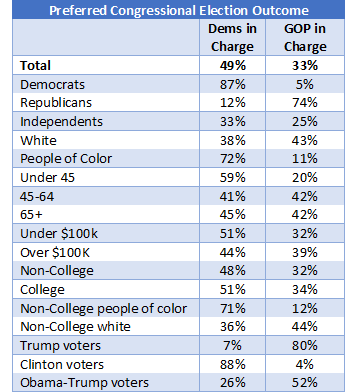 Given these numbers, and the general current make-up of the party’s supporters, it is not surprising that those wanting the GOP to maintain control are a less diverse group. The overwhelming majority is white (89%) and they are disproportionately male. Indeed, white men make up nearly half (49%) of this cohort. Although there is more of a mix when it comes to age, the group is mostly middle-aged: 54% are between the ages of 45 and 64 years old, while just a quarter (24%) are under the age of 45. Two other factors we found interesting with these groups were income and education. When it comes to annual household income, a majority (51%) of those from households making less than $100,000 per year would like to have the Democrats in charge, while 32% would like the GOP to maintain their majority. Among higher income households, Democrats still maintain an advantage but not a majority (44% compared to 39%). When it comes to education, we know that last year’s elections were all but determined by an education gap between the two major parties, however, education is not as strong a predictor of results with 51% of college-educated Americans hoping for a Democratic takeover, and 48% of non-college educated Americans feeling the same way. However, if we breakout these numbers by race there is a clearer pattern with 71% of people of color without a college degree wanting Democrats in charge, compared to just 36% of whites without a degree. This is not to say that half of Americans wanting Democrats in charge is a bad thing for the minority party. However, as we all know, we don’t pick our president by a national popular vote, and the same is true for our members of Congress. For Democrats to enjoy a great night next November, they are going to have to move a large number of voters who voted for Republican candidates in the past. Here is where Democrats should be a little less than thrilled. In our survey, just 7% of Trump supporters want to see Democrats in charge. While this is a decent number of voters, we also find that 4% of Clinton supporters would like to see the GOP in charge. Further, 52% of Obama-Trump voters want a Republican-controlled Congress while just 26% would like Democrats in charge. A net of three percentage points among party switchers, and a quarter of Obama-Trump voters coming back to the Democrats points to picking up seats, but does not yet seem to show an imminent wave. Further complicating things for Democrats is how key voters view Trump’s job performance so far. Not shockingly, President Trump’s job approval rating is incredibly low among voters who want a Democratic-controlled Congress in 2018; 85% of this cohort disapproves of both what Trump has done as President so far and how he has gone about it, compared to just 6% of those who want a Republican-controlled Congress who say the same. But before we equate Trump’s low job performance numbers with a Democratic advantage, among the 18% of Americans who disapprove of how the President has done his job but not what he has done (24% of Americans approve of both the methods and the outcomes, and 52% disapprove of both) 60% want to see the GOP remain in charge. Said in another way, a majority of those voters who are being turned off by how Trump has approached the presidency, are not translating that sentiment into wanting Democrats in charge. All this being said, those who want a Republican-controlled Congress in 2018 don’t necessarily view the party favorably overall. Indeed, 63% of these voters view the Republican Party favorably, one-third (32%) view the GOP unfavorably. And while we can certainly expect to see a few negative ads against the Republicans in the coming months, a negative view of the party does not necessarily translate to a vote for Democrats. The attitudinal differences between these two groups don’t stop there, they also have very different viewpoints on both the current state of the economy, and the future of the economy. Those who want Democrats to take over next year have mixed feelings about the current direction of the US economy; one-third (36%) feel it has stayed about the same, the same number (36%) feel it has gotten worse, and just about one-quarter (27%) feel it has gotten better. This is a very different mood than what’s being experienced by those who prefer the GOP to continue controlling Congress where half (49%) believe the economy has gotten better, and just 16% think it has gotten worse. Those wanting the GOP in charge are also much more bullish on the future of our economy. Two-thirds (65%) of voters whose ideal is a Republican Congress believe the economy is going to get better in the near future, while just 16% of voters who prefer a Democratic-controlled Congress feel the same way. 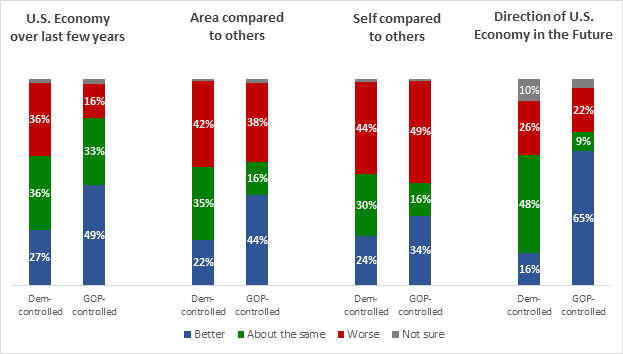 We also see a higher percent of GOP supporters feeling their own economic situation is better than other people, and double the number feel their area of the country is doing better than other areas. These results echo our research from earlier in the year that showed the positive effect Trump’s inauguration had on his base’s feelings about the economy and their own personal economy, and little has changed since. A year is more than a lifetime in politics, and the landscape we are dealing with now, is not necessarily going to be the same next fall. 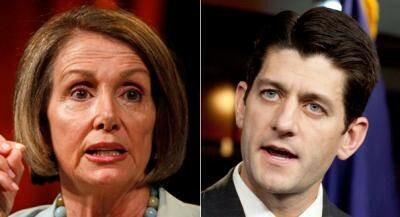 Is it possible that a wave develops, and Democrats win back the House? Of course. But as of right now Democrats need more than just a 50% generic-ballot level of support. They need to start seeing dramatic shifts in these numbers underneath, and they certainly need to see more voters who pulled the lever for the GOP in 2016 become less steadfast in their desire for a Republican held Congress. Democrats need to flip 23 seats to take back the majority and right now just 12 GOP-seats are considered a tossup which means at least 11 seats will need to be won in districts that are more favorable to Republicans than not. As of early November 2017, the numbers are not pointing to this coming to fruition, but a lot can change and we will be keeping an eye on the numbers.